Hotel guests worldwide have placed the AC Hotel Bella Sky Copenhagen among the top ten hotels in the category ‘World of Tomorrow’ making it belong to the world’s hottest and most futuristic hotels. 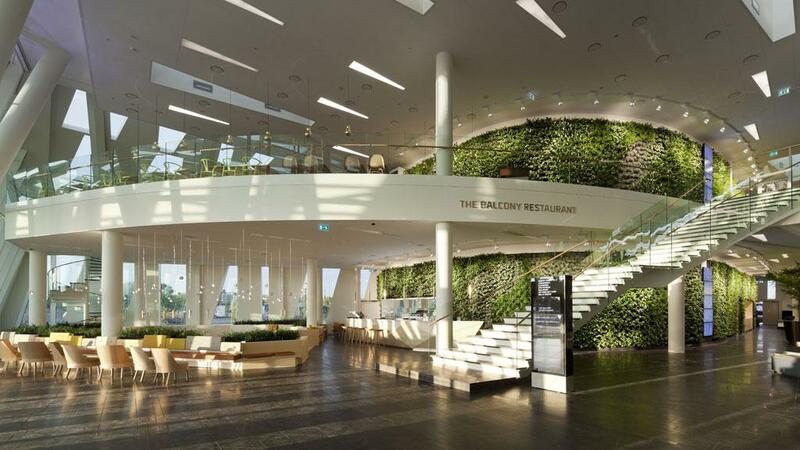 COPENHAGEN, Denmark, 2015-4-29 — /Travel PR News/ — Hotel guests from all over the world have participated in selecting the 4-star designer hotel AC Hotel Bella Sky Copenhagen as one of the world’s most innovative and modern hotels. With a nice seventh place in the category of World of Tomorrow, AC Hotel Bella Sky is in fine company with some of the world’s hottest and most futuristic hotels. The selection of the winner has been conducted based on the reviews of 40 million guests on Booking.com. – We can see that in particular the guests like the aesthetic and modern design and the fact that AC Hotel Bella Sky Copenhagen uses new technology and interior design. They also love that there is a unique view of Copenhagen and all the way down to Køge Bay from the hotel, and not least the hotel’s SKY bar. We are especially proud of the ‘World of Tomorrow’ award, because it is based on feedback from the guests themselves. It confirms us that we did the right thing when we designed and decorated the hotel, say Group General Manager Anders Duelund, who has been there since the inception of the hotel in 2009. AC Hotel Bella Sky Copenhagen, which opened in May 2011, consists of two spectacular towers that are regarded as a unique landmark for Copenhagen. The 4-star designer hotel with its 23 floors and 812 rooms is one of the largest and most futuristic hotels in the Nordic region – and now guests from all over the world have assessed that the hotel is one of the most innovative and most modern places to stay. A total of 600,000 places that provide accommodation throughout the world have been able to participate in a competition to be named the best hotel in the world, and this is based on reviews from more than 40 million guests using Booking.com. In the category of World of Tomorrow, AC Hotel Bella Sky Copenhagen was nominated in the company of hotels such as Japanese Nine Hours in Kyoto, Prizeotel Hamburg-City in Hamburg and Silken Puerta America in Madrid. AC Hotel Bella Sky in Copenhagen is also the only Danish hotel which is on the list of the world’s best places to stay. The hotel rooms are decorated in Scandinavian design and are equipped with all modern facilities. It offers everything from fantastic dining experiences, relaxation and pure enjoyment in the hotel’s spa to unique meeting facilities. The hotel is part of BC Hospitality Group, which is one of the largest companies in Denmark in hotels, conferences, trade fairs and hospitality. This entry was posted in Hotels, Tourism, Travel, Travel Marketing, Travel Services, Travelers and tagged AC Hotel Bella Sky Copenhagen, Denmark, world's most innovative and modern hotels. Bookmark the permalink.